When Orwell’s 1984 is invoked in the context of anti-tobacco and other drug wars, it is usually a reference to totalitarian control. But a rather more specific use of “Orwellian” in reference to those is the twisting of language to make it impossible for people to use the language to question those in power. This is a tactic that is carefully and intentionally employed by the tobacco control industry to prevent reasoned discourse (which they would surely lose). I have been meaning to write more about it, especially in the context of “addiction”, but for today, one quick example. By the state’s estimate, illicit cigarettes cost Washington taxpayers a staggering amount of money. Oh really? Exactly how does not paying taxes cost taxpayers money? And yet the Orwellian nature of the language around tobacco means that they can get away with that claim, unquestioned. It is obvious that, at worst, the impact on taxpayers (as a collective group) is neutral. Of course, that assumes that tobacco/nicotine users are considered to be people, and people who are due the same consideration as everyone else. The bottom line is that the language has been twisted so that taxes on cigarettes (etc.) are not treated as taxes, or burdens on people at all, so absurd statements like that quoted above pass without notice. 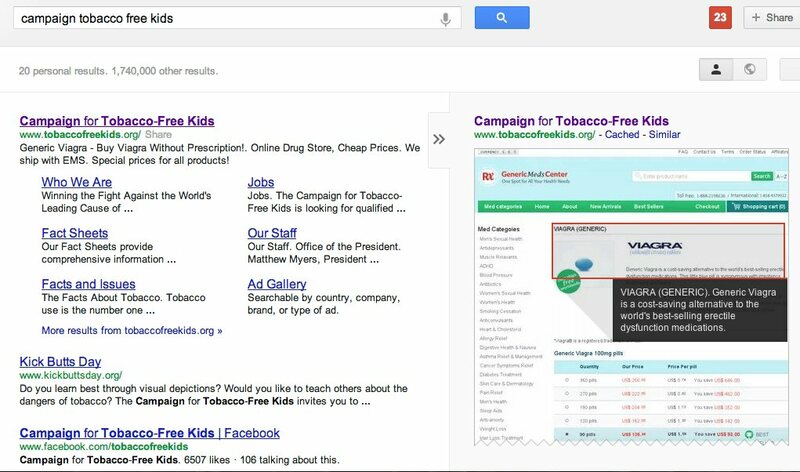 A friend sent me a screenshot of a Google search of “Campaign for Tobacco Free Kids” which reveals an interesting twist on that organization’s fund raising strategies: the headline content for their website appears to be an ad for “generic Viagra”. So either they are not satisfied to confiscate untold riches from the involuntary contributions of overtaxed smokers, and so are picking up a bit of extra revenue, or they are trying to encourage the creation of more kids so that they have reason to demand more funding. I suppose there is a third explanation, that they are the victim of some kind of hacking, but I like my other theories better. If you do the search soon, you can probably see the same result (it worked for me), though I have to assume they will fix it eventually. But they will probably not discover it via this blog — it is pretty clear that they carefully avoid reading anything outside of their echo chamber for fear of encountering legitimate criticism and troublesome questions. And besides, they are probably busy right now, trying out their free samples of generic Viagra.